Rheumatoid Arthritis is a painful autoimmune disorder that causes the body’s immune system to turn on itself. This leads to problems with joints, connective tissues and sometimes organs such as eyes, heart and lungs. It’s currently incurable but research continues into new ways of controlling and slowing the progress of the disease. Many people know little or nothing about the disease which affects around 690,000 people in Britain and over 1.5 million in the USA, often confusing it with the more common osteoarthritis. A survey commissioned by NRAS and carried out by ComRes shows that only “10% of people believe the British government is doing a good job of raising public awareness about long term conditions like Rheumatoid Arthritis”. The ‘Breaking Down Barriers’ report showed that the British public has a very limited understanding of the disease. 41% of people surveyed said they understood the symptoms of the disease. Only 10% had seen any kind of information displayed in public such as at doctors’ surgeries etc. 48% were unaware that RA shortens life expectancy and only 16% knew the disease affects internal organs. Many people believe that Rheumatoid Arthritis is an old person’s disease whereas in fact it can affect people of all ages, even young children. The earlier that treatment is started, the better the outcome for the patient. The disease affects more women than men and the most common age for diagnosis is between 30 and 50 years of age meaning people are having to cope with the disease whilst working and raising a family. If you think you may be developing the symptoms of Rheumatoid Arthritis, don’t wait, go and see your GP straight away. For more information see the NRAS website. This year’s festival takes place in the Scottish town of Largs between Saturday 31st August and Sunday 8th September. 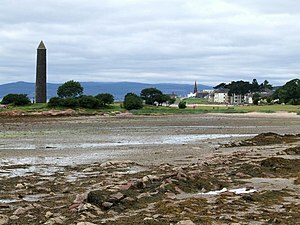 The Festival commemorates the Battle of Largs which took place in 1263 between the Vikings from Norway, under King Hakon and the Scots, led by King Alexander III. There will be two authentic villages built, one Scottish and one Viking, showing how people lived at the time of the Battle of Largs. You can find out how they made their clothes, what they ate and what religion they followed among other things. The Scots village will be run by the re-enactment group the ‘Swords of Dalraida’, whilst the Viking village will be run by the ‘Glasgow Viking’s.I personally know members of the ‘Glasgow Vikings’ and I can assure you that they take the authenticity of their clothing, weapons etc very seriously and have fascinating stories to tell of what life was like as a Viking. There will skirmishes by both sides and a wide variety of other activities including dancing displays, music and if the weather permits an aerobatic display.There will be a craft fayre, a farmers’ market and a continental market as well as plenty of activities for children. The main fiesta on the Spain’s Costa Blanca in June is the Hogueras, celebrated in the week or so leading up to the Noche de San Juan on 24 June. 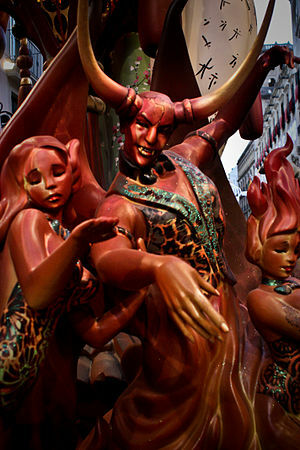 Most of the towns in the Costa Blanca area join in the celebrations, but the biggest display by far is in the city of Alicante. The festival owes its origins to pagan times and coincides with the summer solstice. Traditionally, old bits of furniture or other unused wood was burnt on bonfires. 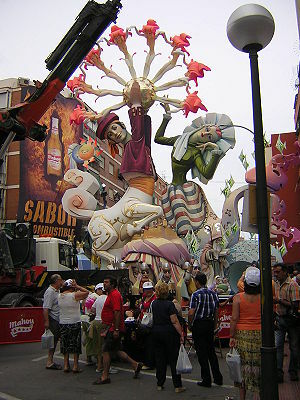 Nowadays, however, special creations, called “niñots,” are made depicting everything from cartoon characters to caricatures of local and national politicians, in a similar way to the Fallas celebration that takes place in March in Valencia. These are made by skilled craftsmen who spend all year coming up with the designs and building the models. They can cost thousands of Euros to make. The models are put on display in the streets of each town for a week or so prior to the 24th June. In Alicante, the models tend to be huge and very impressive. Prizes are awarded for the best ones and the winner is saved from destruction to go on display in the Hogueras museum. Next to each model is an open air café where people who have paid towards the building of that particular Hoguera (or Foguera in the local Valencian dialect) can sit and enjoy a drink or tapas during the festivities. Quite often patrons will get up and dance enthusiastically, either to bands or to piped music. These bars are called “barracas” and some are open to the general public too. Then on the big night, all the Hogueras are set on fire, accompanied by fireworks from the castle overlooking the city of Alicante and along the port area and the cheering of the crowds who usually end up with a soaking from the fire brigade who are on hand to make sure that everything stays more or less under control. The children especially enjoy that part of the proceedings! There are usually events such as giant paella making competitions, verbenas (open air dances) and competitions for the children during Hogueras week. A special beauty queen, called the “Belleza de Foc” (Beauty of the Fire) is chosen and she is expected to take a leading role in the fiesta plus continue with various civic duties through the year. Usually, the “Belleza” wears a traditional costume with a huge skirt and a lace “mantilla” or head-dress which are specially made and cost a fortune. There is also a junior “Belleza” and both are accompanied by two princesses. The festival is very popular with tourists and locals alike, with huge crowds in the streets and a week long party atmosphere. Not to be missed if you are going to be on the Costa Blanca in June. Just two months after announcing that he was suffering from terminal cancer of the gall bladder, Iain Banks has died aged just 59. The Scottish author of works such as ‘The Wasp Factory‘ and ‘The Crow Road‘ sadly didn’t live long enough to see his last work ‘The Quarry’ on the book shelves, despite his publishers bringing the publication date forward to June 20. 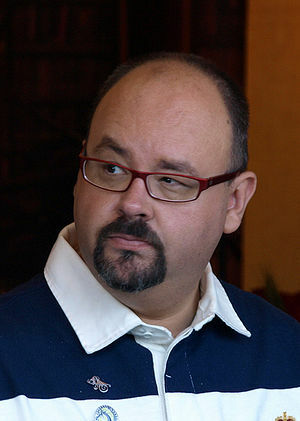 Born in Barcelona in 1964, Carlos Ruiz Zafón is fast becoming one of the best known Spanish novelists outside of Spain. Starting out as a writer of fiction for young adults, he turned to adult novels in 2001 with the publication of ‘The Shadow of the Wind‘ (La sombra del viento), followed by ‘The Angel’s Game‘ (El juego del ángel) in 2008. In 2012, the third of what is to be a four book series, ‘The Prisoner of Heaven’ was published in English. The books are suspense novels reminiscent of film noir, which Ruiz Zafón says are one of his main influences. He has said in interviews that he thinks of scenes in his novels as they might appear on the silver screen. The books also pay homage to the great gothic classics such as those of Wilkie Collins or ‘Rebecca’ by Daphne du Maurier. The writer lists authors such as Charles Dickens, Victor Hugo and Raymond Chandler among those he considers should be read by everyone. If you are looking for something with a difference, with strong characters, excellent storylines that really make you think, then pick up ‘The Shadow of the Wind’ and head into the streets of Barcelona with Carlos Ruiz Zafón.